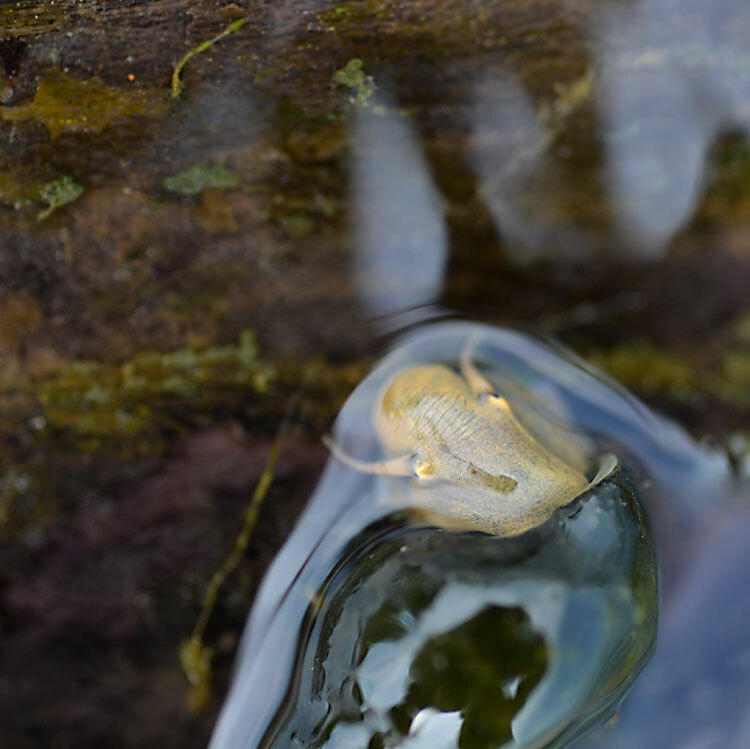 Rivers are full of strange life, some of it quite interesting when you get close up. 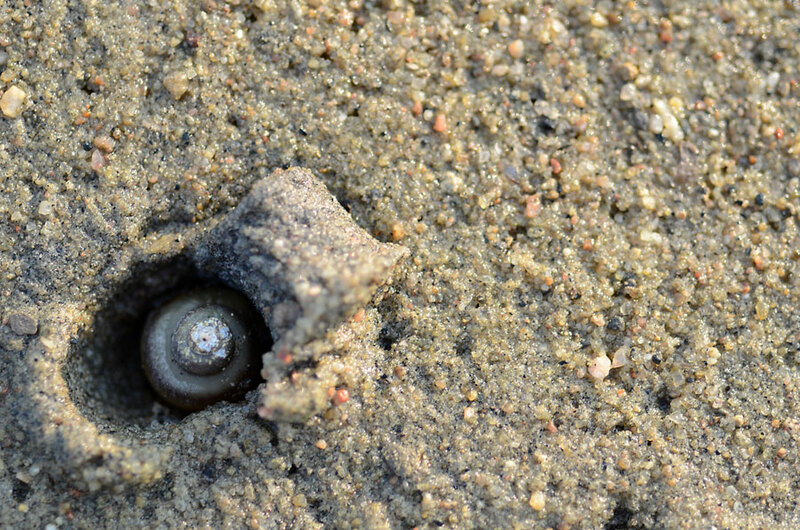 Some snails are out in the wet sandy areas in the evening and early morning, as the day becomes too warm they work their way down into the sand and disappear. 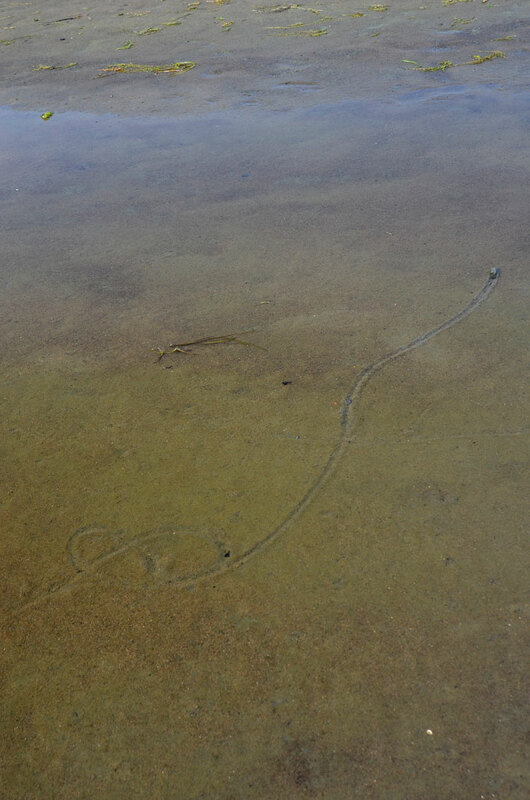 Below: A set of lyrical snail trails, with snails burrowed into the sand at trails end. 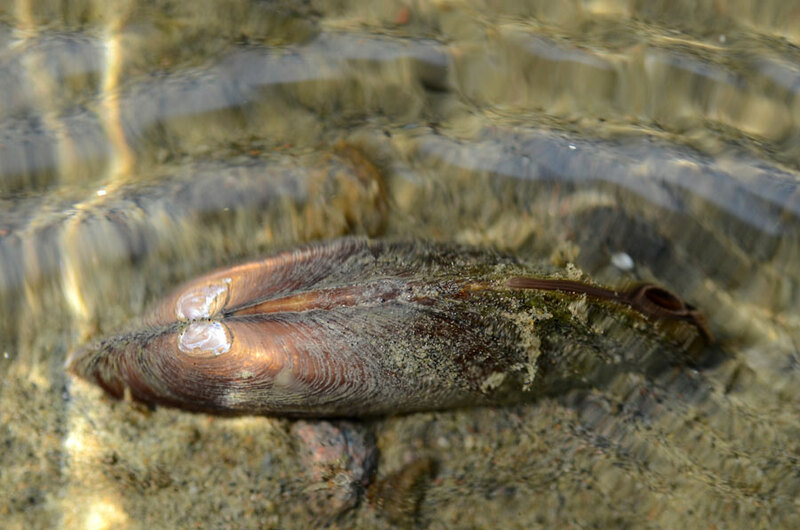 Below: A close up of a freshwater mussel slowly working its way along in the shallow water. Note the oval opening on the right which is covered with small cilia (hair-like structures) for filtering and collecting tiny food particles. 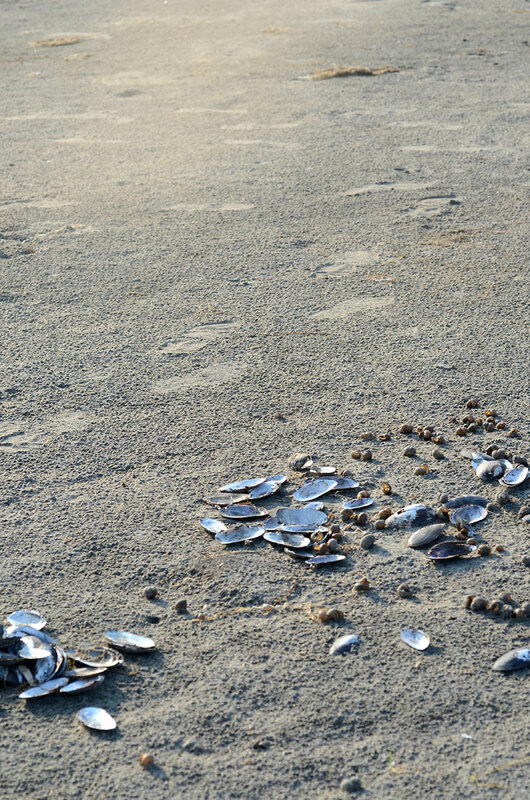 Empty mussel and snail shells gathered on the sand. Very nice . . . Something I don’t get to see where I live (or lived). forgot to say . . . the second one is awesome. Wow – these are so foreign to where I live (high plains of Texas) that they just seem other-worldly. I can’t stop looking at them…. Melinda, I find them pretty interesting, too. Especially using a macro lens! Thanks. 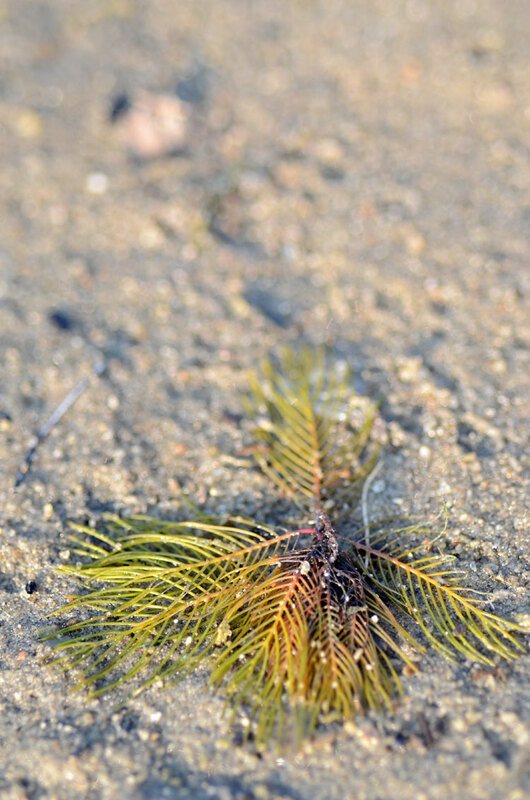 I love these – nature making art; art in nature. The way mussels eat is so cool! The image that really had me – #3. Wonderful work as always! Thanks, Marina. Mussels are very interesting. They filter all kinds of things out of the water and help keep the river healthy. 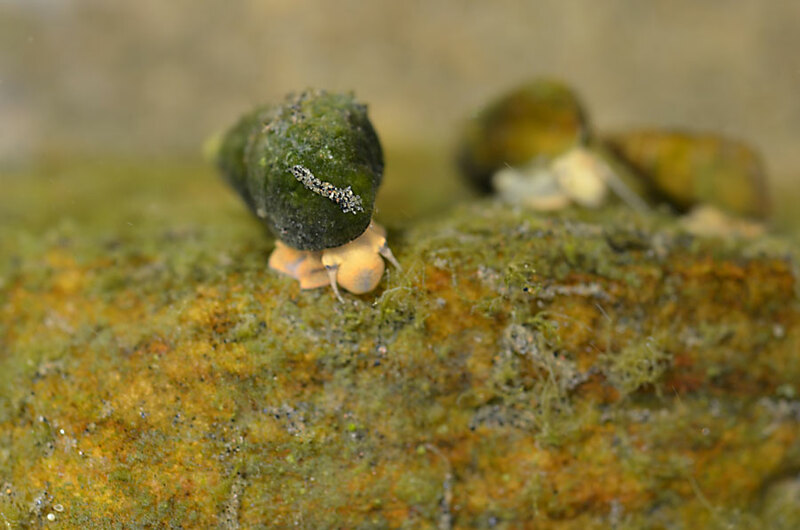 Love the snails – great macro work. These are so incredibly beautiful. I know it’s fresh water, but it reminds me of the thrill of finds at the seaside when the tide goes out. Thanks so much. I know what you mean, it feels a bit like the tide being out with the low water level! Very neat Karen. Good colour, and neat control of light to shoot through the water like that. Thank you, Al. I could use a polarizing filter for the macro lens! alien space-ship. Image itself defy our perception of the size and the reality. I agree, they are cute! Thank you. So fabulously delicate, and the light seems really pure too. Yes, early morning. Pure light and air. It was perfect. Thanks, Helen. instructive and enjoyabe (snailien – lol!). i especially like the second and third photographs, but the whole set together tells a complete story. Thanks for your comment, Alessandro! wonderful work Karen.. you tell the story so well. I love those snail and mussel trails. 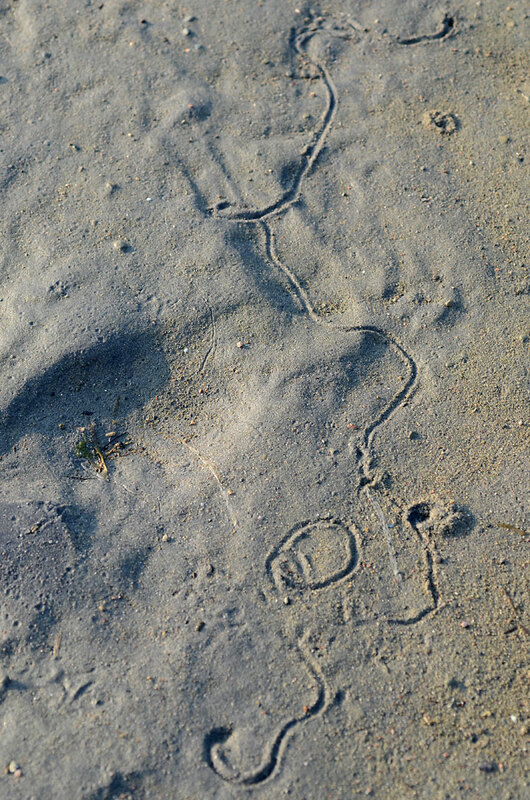 It’s funny to see the squiggly journeys they have taken drawn out in the sand. You are so knowledgeable about your subject matter too I think that is great! 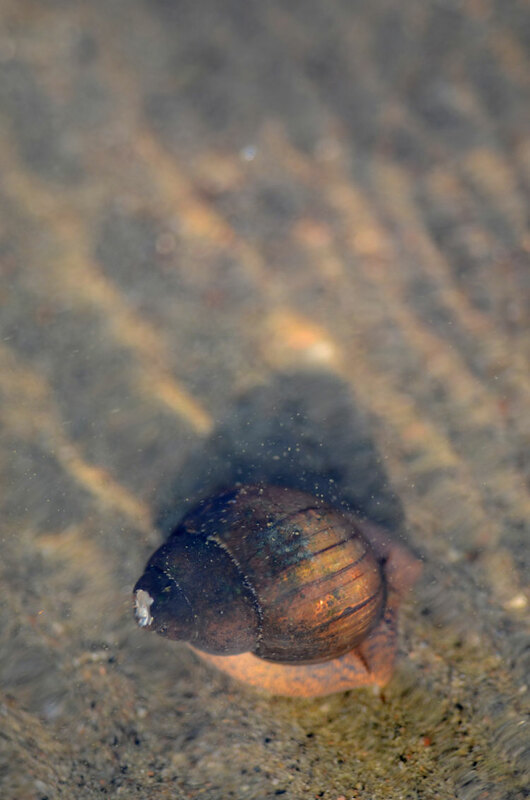 Love the snail under the water “bubble”. I thought for a second it was a tadpole. Snails are fascinating aren’t they? I’m sure they have inspired some movie characters. Thank you! 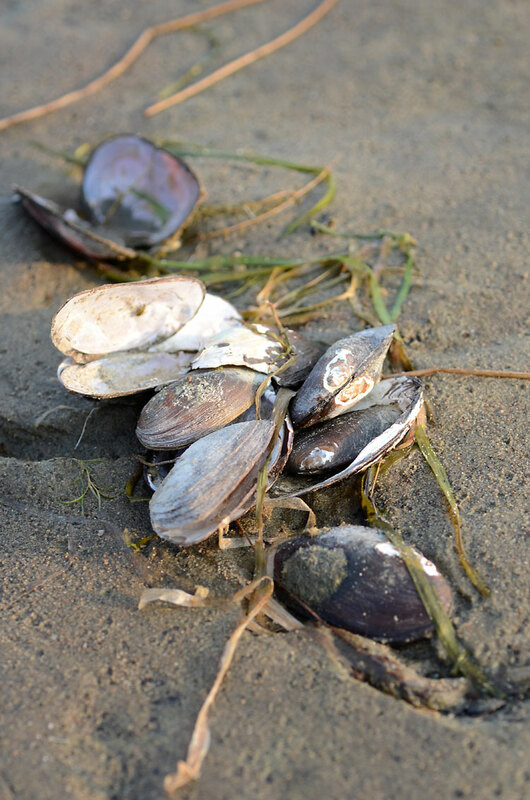 I don’t think anyone eats the river mussels , they filter all the toxic things out of the water. They are great river cleaners! You captured exactly what it feels like to stroll the beach with eyes down, and the sun on your back. Just lovely! Your Reflecting Snail has some very luminous blues. I Love the alien aspects. A great series! I especially like the “Snalien” and the “Snail Descent.” The light on the Upright Snail is beautiful, too. There is something very sweet about snails. 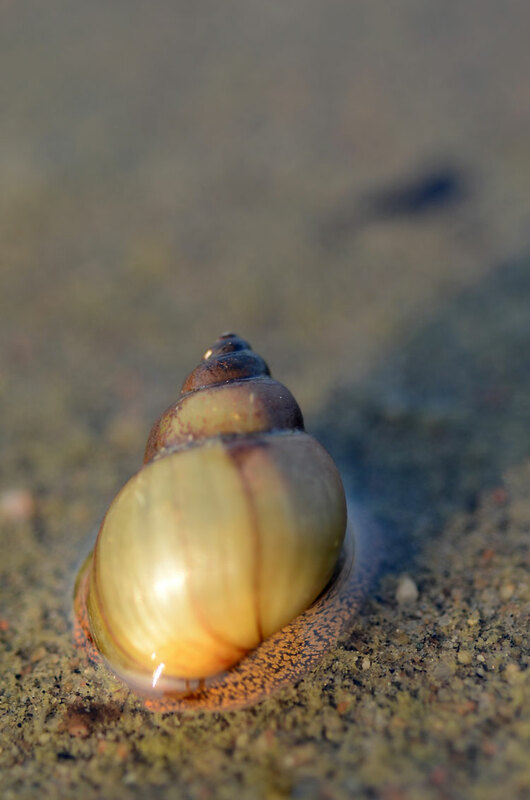 I didn’t realize quite how in tune I was to their vulnerability until I felt absolute horror when my four-year-old daughter (newly awakening to the fascinating world of snails) pulled one off of rock last week. It was so happily anchored to the side of a rock, and she popped it off, just certain it would be happier in the water. 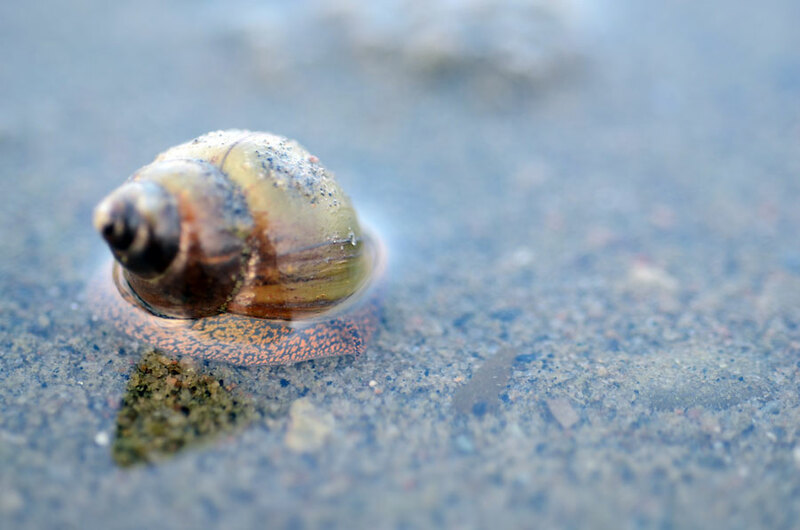 I’m sure it happens thousands of times a day (children yanking snails from wherever they’ve suctioned themselves), and who knows what a snail really feels, but all I can imagine is what an assault it must be on the snail’s senses. I’m sure her little plucked snail will survive, but I know what you mean. I was thinking about how there may be snails buried in the sand under my feet and it made me tread lightly. Thanks for your comment, Lemony. Their life activity are land art…Great works and photographs. Yes, land art. A nice way to put it. Hypnotic and lovely. What would typically make me squirm shows off its unique beauty here. I’m glad you find it lovely. They are interesting creatures! Thank you, Inga! It’s a lovely area to work with. Wow, Karen. Some of these, i’m looking at for the first time! They are just gorgeous! Sorry for the late comment! But these images are really lovely! I love the detail, colour, and composition! I love this view of life….